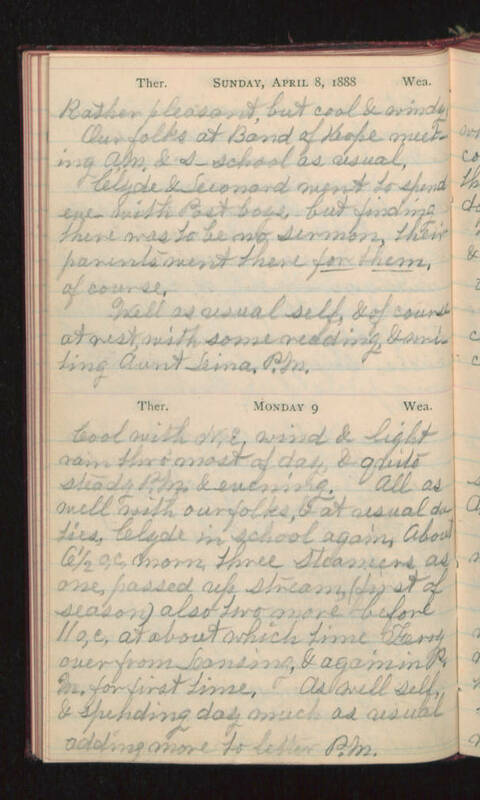 Sunday, April 8, 1888 Rather pleasant, but cool & windy. Our folks at Band of Hope meeting A.M. & s-school as usual. Clyde & Leonard went to spend eve with Post boys, but finding there was to be no sermon, their parents went there for them, of course. Well as usual self, & of course at rest, with some reading, & writing Aunt Lina, P.M. Monday 9 Cool with N.E. wind & light rain thro' most of day, & quite steady P.M. & evening. All as well with our folks, & at usual duties, Clyde in school again, about 6 1/2 o,c. morn three steamers as one passed up stream (first of season) also two more before 11 o,c. at about which time Ferry over from Lansing, & again in P.M. for first time. As well self & spending day much as usual adding more to letter P.M.